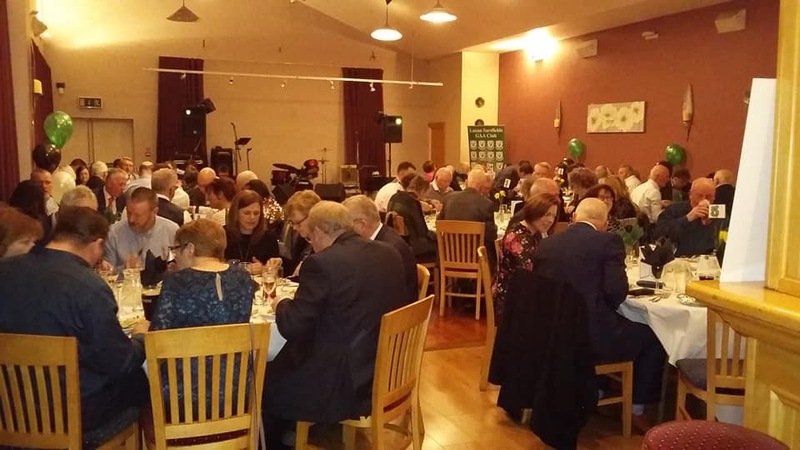 A great night at our Annual Dinner Dance on Saturday the 9th February , a full house enjoyed dinner and dacing. 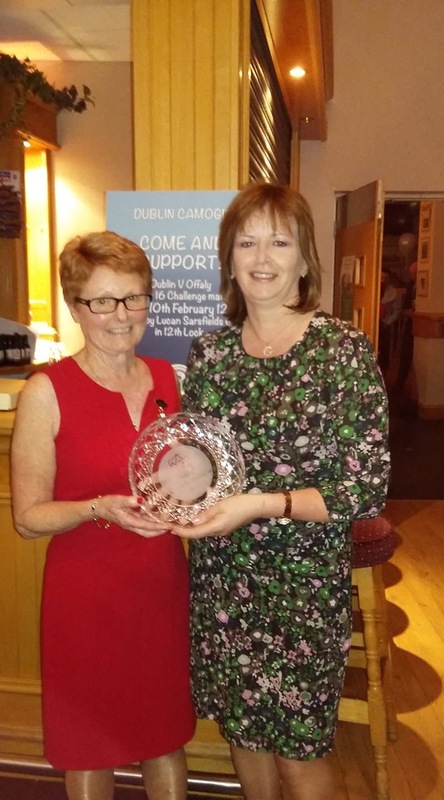 Congratulations to Mary Reynolds who received the Gradam an Uachtaráin from our new Uachtarán Kathleen Roche. 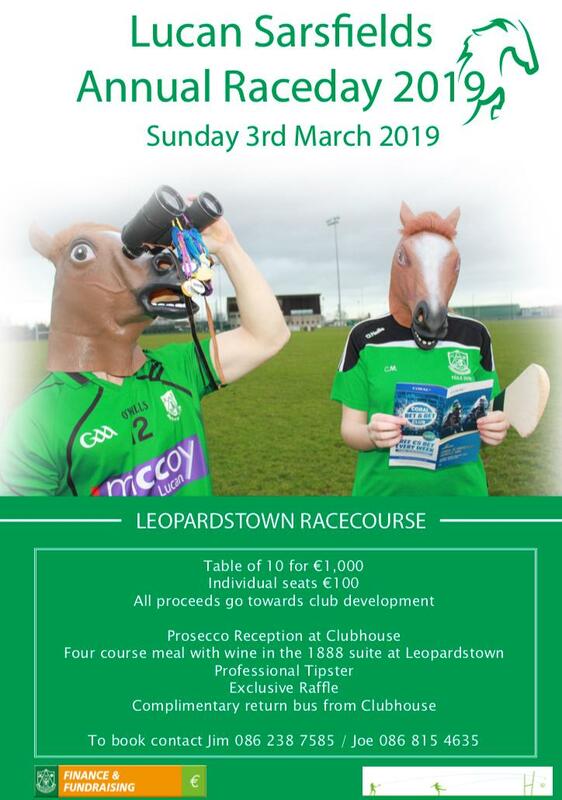 Next up is Leopardstown Leaps race day; Sunday the 3 March; A great day out, Prosecco reception in the club, bus to race course, 4 course meal with wine. Tipster and hopefully back with plenty of winnings, Contact Jim 086 238 7585 or Joe 086 815 4636 to arrange a seat (€100) and or table. Lotto There was no winner of the lotto on the 7th February; Numbers were 9, 18, 19 and 24. Next weeks’ jackpot €11,000, draw will be managed by Shay Hurson and is sponsored by Dual Printing Ltd. Lucky Dips Winners: Alan McCarthy, Paul Heneghan, Michael McAndrew, Patrick Healy and Paul McGann. Play Online here, Or Tickets can be purchased at the Club, or in Kenny’s Vesey Arms. 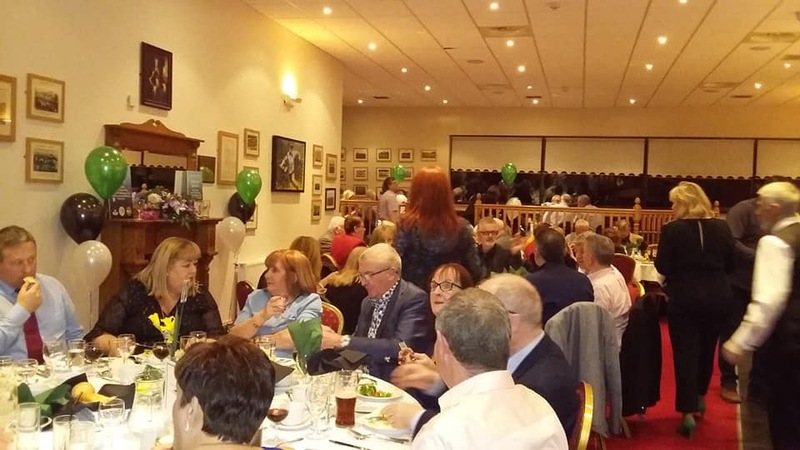 The Golf Society 2019 AGM will be held in the clubhouse on Monday 4th March at 9.00pm. All are very welcome. Gerry Mescall is the Society Captain for 2019 and we wish him well and ask you to support Gerry and your Society during 2019. 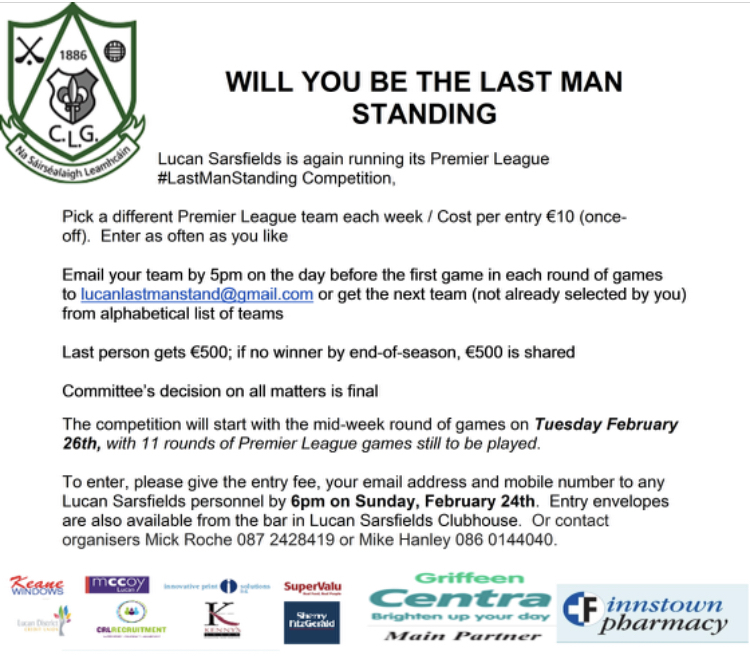 Will you be the LAST MAN STANDING – we are running a Competition , as a fundraiser for our Senior Hurler, pick a premier league team each week, competition starts on the mid-week games of Feb 26th. €500 for the winner, Entry by 6pm Sunday 24th for entry and full details email lucanlastmanstand@gmail.com or contact Mick Roche 087 242 8419 or Mike Hanley 086 0144040 €10 entry. Our deepest sympathies to the Flanagan family on the recent loss of Jimmy. RIP. Commiserations to Darren Gavin who was part of the Dublin Senior footballers who lost to Kerry, great to see him starting his first league game though. Elizabeth Mc Nicholas, daughter of John Mc Nicholas of the Dublin County Board, is a twenty-nine year old former Camogie star from Lucan, who is confined to bed for the last three years due to the back bending condition of scoliosis, and other debilitating ailments. She lives in Esker Park, Lucan. Her Dad, John, is a member of the Dublin County Board and her brother, Seán, is a hurling referee. Elizabeth has spinal problems, scoliosis, kythosis, pituitary problems, muscle weakness and only 35% lung function. She is a brave girl who is fighting hard to lead a normal life and continue her studies. See 'Team Elizabeth' online for further information and updates. We are holding a Bumper Table Quiz as a fundraiser for Elizabeth's cause, on Friday, 15th Febuary, in the Clubhouse. The Quiz commences at 8.30pm sharp. Tables of four cost €40 and we will have a huge raffle also. We hope to get a massive turn out of support to enable us to raise as much as possible for this extremely deserving cause. 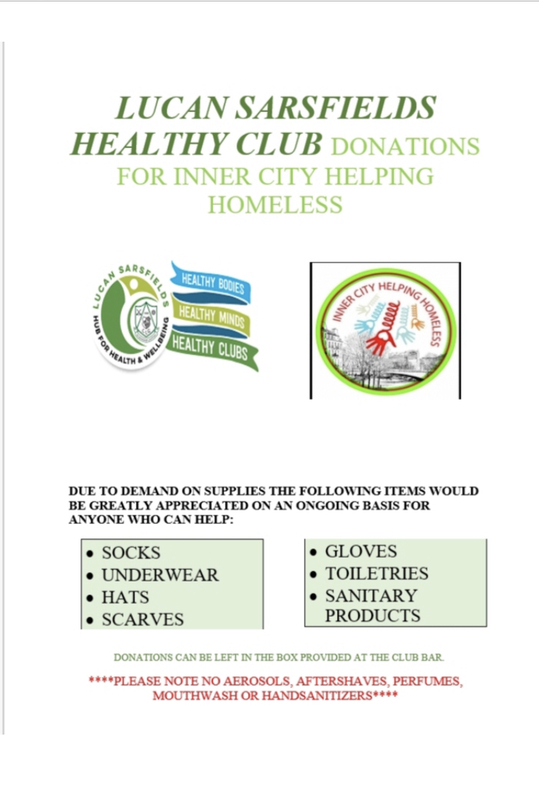 Our Healthy Club Committee has left a donations box in the bar for members to donate items to ICHH. See Poster for details. Also a big thanks to all who supported the very successful ‘Ladies Night In’ last year. The Lucan Healthy Club Committee presented a cheque for €1000 to the Irish Cancer Society, for Breast Cancer Awareness, raised at last year's event. Watch out for news of this year's "Ladies Night In" coming up in May. Official Adult action starts next Sunday with all our Adult football teams at home. Snrs and Inters at 10:30am, Jnr As at 12.00, and finally Jnr Bs at 3pm. Also Minor A hurlers are at home at 11am and Minor B hurlers away at the same time. Many of the Juvenile football teams were back in league action this weekend. Lucan’s U12A boys travelled to Cuala for their first taste of competitive football. On a blustery morning Lucan’s lads started well showing a good intensity and some very good passages of pass &amp; move football. Early scores from Oscar Brennan, Michael O'Brien &amp; Patrick O'Connor put Lucan in a strong position and saw them storm into a 10 point lead but Cuala were working hard and posing a threat forcing Lucan to maintain their workrate and defensive shape. A great goalkeeping display by Evan Flynn with brilliant defending from Cian McCormick had helped keep Cuala out leaving aH/t score of Lucan 4-4 to Cuala 0-3. The second half saw Cuala apply the pressure to reel in Lucan in with some good scores but Lucan’s ability to move the ball quickly and create and take some scoring opportunities of their own ensured that the Lucan lads remained in control. Lucan maintained their performance to the end to record a fantastic away win against a strong Cuala side on a final score line of Lucan 8-8 Cuala 3-4. A good team display from Lucan with all players playing their part. E Flynn, M Byrne, C Mc Cormick, G Lynch (0-1), K Costello (0-1), C Reilly, C Gavin (0-1), D Taaffe (1-0), K Quinn, M O'Brien (1-1), P O'Connor (3-2), O Brennan (3-1), J Mills, C Healy (0-1), A McMahon. 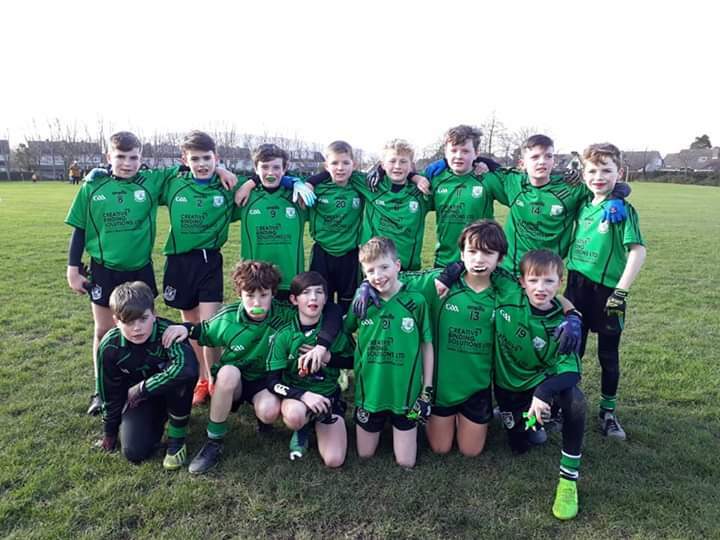 Lucan’s U-12B footballers played St. Judes in St. CatherinesPark on Saturday morning. Lucan started against the wind and found a physical and determined Judes team difficult to break down. A much improved second half performance by the Lucan boys saw them score a couple of good goals but the gap was too much to breach. Final score was Lucan 2-01, St; Judes 3-09. 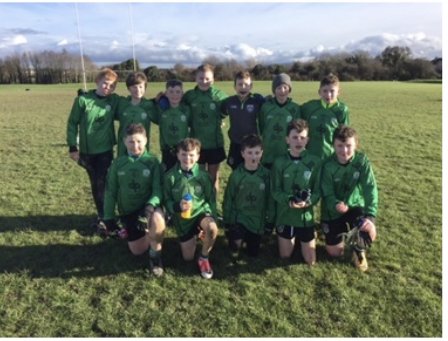 In the U-13 Grading Football Division 2 league, Lucan lost out to a strong Thomas Davis side on a score line of 8-12 to 4-05. Match was played on a blustry Saturday afternoon in Kiltipper. Lucan started brightly and raced into an early lead from some early goals. However Thomas Davis gradually got back into the game and closed the gap approaching half time, where Lucan held a 5 point lead. However playing against the wind in the second half made scores hard to come by and Thomas Davis pulled ahead midway through the second period. After Lucan had been reduced to 14 players Thomas Davis took full advantage and ended up with a comfortable win. Squad: Sean Treanor, Chris Hylands, Reece Kelly, Gareth McDonnell, Robert O’Connell, Callum Morris, Aaron Malone, Liam Fitzgerald, Callum Keane, Gavin Collins, Adam Rock, Daire Collis, Charlie McHugh, Louie Fanning, Robert Keher. In the U-13 Grading Football Division 6 league, Lucan lost out to Man O War on a score line of 6-04 to 0-05. A difficult opening grading game on a very heavy pitch saw Lucan off to a slow start conceding some heavy scores in the opening period. The half time break was welcomed and Lucan settled more into the game with good direct running at the opposition goal yielding some fine team points. The Lucan boys would hope to continue the second half form into a tough away game v St Vincent's next week with plenty to work on. Match Report: The grading games got underway today for the U13C who were down a few players from the start. In the second half Lucan defended well restricting the opposition chances and goalkeeper pulling off some great saves. As the game went on Lucan were getting tired but still managed to work the ball into the opposition half and keep it there for prolonged periods which resulted in 4 more goals. A windy Sunday morning set the game up for a typical two half affair. Playing into a very strong breeze in the first half, Lucan played in fits and starts, scoring three points but conceding 2-06. The majority of the damage was done in the last 10 minutes when constant pressure from the visitors saw the lads concede 1-06 without reply. This set the second half up for a determined fight back. Chasing down the 9 point deficit did not start fluidly but after 10 minutes Lucan began to pile on the pressure and started to claw back the deficit one point at a time. The boys really dug deep and didn’t have it all their own way having to defend in patches when St Sylvesters broke out but some excellent scrambling defence set up further attacks which resulted in scores. The lads had the opportunities to win and had a goal disallowed and although this was a set back, the lads dug deep to draw level. In the U-15 Division 7 league, Lucan fell to a defeat against St. Pats (P) on a scoreline of 5-13 to 1-02. The U16A Footballers had their first league match of the season away to Castleknock. Lucan played the first half against a strong breeze and Castleknock pounced first with an early goal. However, as the half progressed, Lucan began to play some great football, quick offloads, good recycling and began to build a lead as the first half drew to a close. Castleknock then got a couple of scores to leave the sides level at half time, 3-5 each. This was despite Lucan playing some great team football which was not reflective in the score. The second half began with Lucan picking off a few points and building up a 3 point lead. However, a harsh second yellow card meant we played the last 20 minutes with 14 men. However, it did not deter from the team building on the lead, and also confining Castleknock to a solitary point in the second half. Some great defending and scores from the forwards in the second half laid the foundation for a well-deserved win at the end. Overall, the squad showed great resilience and character to run out winners in the end and the scoreline did not reflect the great football we played at times. Squad – Cathal Doody, Neil O’leary, Aidan Sheary, CillianMorrissey, James Finn, Sean Harkness, Sean Quigley, Stephen Ramsay, Rian Carey, Jamie Lavin, Samuel Keogh, CiaránScully, Jack O’Donnell, Brendan Kavanagh, Sam Noctor, Reece Lamphiere, Tony Mulqueen, Jack Lawlor, Adam Whyte, Hugh Cuffe, Matthew Coogan, Louis Butler.